Remember we face elections all the time. For this election, Kelly is not running but his nemesis Matt Cartwright is running and Brian asks you to vote for John Chrin. For US Senate, Kelly was going to run but Lou Barletta has the same platform as Kelly. Please vote for Lou. Nobody else running is pro-life and pro-Pennsylvanian. Think about that. Chrin and Barletta love the President as does Brian Kelly. Why Trump? 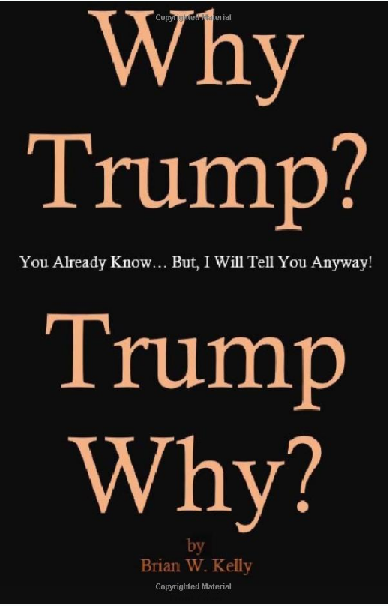 2016 Subtitle: You Already Know but I Will Tell You Anyway!—This is the linchpin book that describes Donald Trump's great plans for America and it brings in the opinion of many great Americans. This book takes the time to tell the reader why Donald Trump should be President of the United States. If you are not sure, you need to read this book. This book is quite simple. It helps the reader learn how Donald Trump will save America. There are no jokes in this book. With the Annual Guest Plan, the 60 million interlopers in America have a better shot at life than in their home countries? The Every Congressional solution to the occupation of the US by 60 million illegal foreign nationals is trumped by the idea that border security must come first. Yet, as perhaps this is merely a ruse by Congressmen in the pockets of lobbyists and donors, border security never comes. Contact Information & Little More! As you know quite often email addresses that are open such as ours are the victims of SPAMMERS who swell the emailbox, making it difficult to find legitimate questions. As long as we are able to work with this valuable source of contact, we will keep this line of communication open. No Contributions / Donations, Please! Read more: Contact Information & Little More! Question: I have read a lot of the stuff on your site and, other than that you don't seem to be a normal Democrat, and I am not so sure about that, why should I vote for you? Answer: Thanks for the question. I wrote many of the things on this site myself so I am not sure if you really read them all. I am not sure that I can convince anybody that I am worthy of their vote. Though the fact that an ordinary guy permits himself or herself to go through this process, I think that unless they have other ideas about a representative democracy, that ought to be enough. Let me take a crack at this question though it intrinsically annoys me. Don't hang up early on this... OK? Read more: Why Should I Vote for You? Irish Need not Apply! Syrians need not apply! Italians need not apply! Spanish need not apply! Polish need not apply! How many of our parents went through tough times in the USA finding bigotry instead of work when they sought employment? 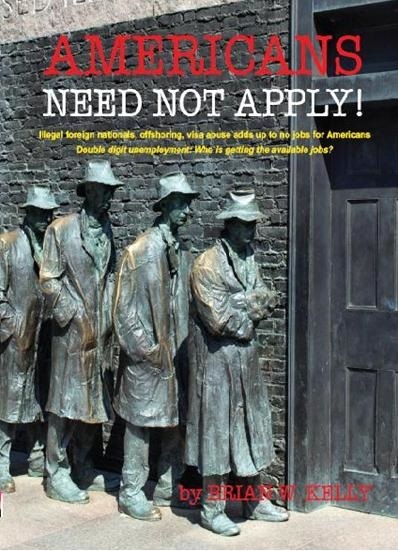 Read more: Americans Need Not Apply! Says It Is Time To Return The Government To The People! These books help Brian Kelly Survive! If you would like to see other articles on a number of patriotic topics, feel free to visit www.brianwkelly.com. Brian's 2016 plan is to serve one term in Congress in the House and follow it up with one term in the US Senate. Recent work by Brian was once hosted by conservative action alerts, but they did not make it as an entity. This patriotic site unfortunately did not survive. To keep his editorial content alive, Kelly moved it to his personal web site at www.brianwkelly.com. Enjoy! First Ever PA / US Candidate Running for the US House and the US Senate Simultaneously! The US Visa programs have been used by corporations and a complicit Congress & President to sell out American intellectuals and skilled service workers in recent years. The scam continues even while Americans are unemployed in record numbers. The Visa Program had noble beginnings and there is no obvious problem with the type of people who come in on visas. However under certain visa types, employers get a big bonus as they can access foreign technical talent for slave wages. Brian Kelly is married to the former Patricia Piotroski and the couple resides in Northeastern Pennsylvania as they have all their married life of forty years. They are the proud parents of three wonderful adult children, Brian, Michael, and Katie. Brian Kelly was born and "raised" in Wilkes-Barre PA. He attended St. Boniface Grade School and Meyers High School. Brian was both a pitcher and a catcher on the Meyers High Baseball team and he was active in many school clubs as well as the student council. Greed Is the Secret for Returning Jobs to America! Bringing Back US Jobs from Offshore -- Greed Is the Answer! "Corporations have been enthroned and an era of corruption in high places will follow, and the money power of the country will endeavor to prolong its reign by working upon the prejudices of the people until all wealth is aggregated in a few hands and the Republic is destroyed." Read more: Greed Is the Secret for Returning Jobs to America! Question: Are You a Democrat in Name Only (DINO)? That is a great question. Thank you! I may not know the answer to that question but I will tell you how I feel. A long time ago, when I was a kid, I believed the Democrat Party was the party of the people. Though I started out as an Independent, I became a Democrat in my early twenties because of the principles of the Democrat Party. My father believed in these principles also and he taught me them at the time. Democrats represented the ordinary people and the Republicans represented business. The people needed good representation from the Democratic Party because big business already had the Republicans. Read more: Are you a DINO 2016 Update? Book Preface: Jobs! Jobs! Jobs! This is both an essay and a Preface for Jobs! Jobs! Jobs!. All of the essays in this Jobs! Jobs! Jobs! menu have already been packaged into a book titled Jobs! Jobs! Jobs! When you create a book, it needs introductory material. Much of this is packaged in a front matter item called the "Preface." Front matter comes before all of the other material in the book. Typically nobody wants to pay for Front Matter. When they buy a book, they are mostly interested in just the chapter or essay contents. Anyway, this is no ordinary Preface. As you may know, the whole book titled Jobs! Jobs! Jobs! is free in this section of the site (you just do not get the paper) . Without having the preface that I wrote for the book, it would really be incomplete. Read more: Book Preface: Jobs! Jobs! Jobs! Question: Why are you running for Congress? As a husband and father, my family was very important in this decision. in 2008, I considered running and my family and I discussed it at length and I decided not to run. In 2010, I put a team together, and I saved some money and my family gave me encouragement, though they still had some trepidation about the potential impact on our family unit. We'd like to remain reasonably private and regular people. At the same time, there were other factors. This year, six years after having the #1 position on the ballot for the Democratic Primary, I am running again for Congress as a write-in candidate, because of a number of reasons. I am running as a write-in because I simply cannot afford to try to outspend the fat campaign war-chest amassed for Matt Cartwright. So, I am running a campaign on the cheap but with your help, I will prove that money does not trump the will of the people. Read more: Why are you running for Congress? Great Book - Jobs! Jobs! Jobs! - And It's Free! Hopefully you will elect me your next Congressman and we will not have to fear the lack of jobs anymore. I know how to bring Jobs back to Northeastern PA and the USA at large. I am a regular citizen and not one of the elite. Why not give me the opportunity to help all the people -- US! When I ran for Congress in 2010, I wrote a book for all Americans. The title is Jobs! Jobs! Jobs! The subtitle is Where Did They Go? How Can We Get Them Back? In 2016, I revised and updated this book and it is available for free on the briankellyforcongress.com web site. www.bookhawkers.com. Check out the BookHawkers site to find other great patriotic books. Scroll on the site menus right on the Congress site to find all the chapters in the Jobs! book available as free downloads. The book is a compendium of many essays about the Jobs! Jobs! Jobs! problem in the US and NEPA. Enjoy it for free or buy a hard copy from bookhawkers. You can read these essays, which are much of the substance of the book, free on the web site. You never have to buy this book unless you want hard copy. Kelly has packaged a deal for you that you won't believe. 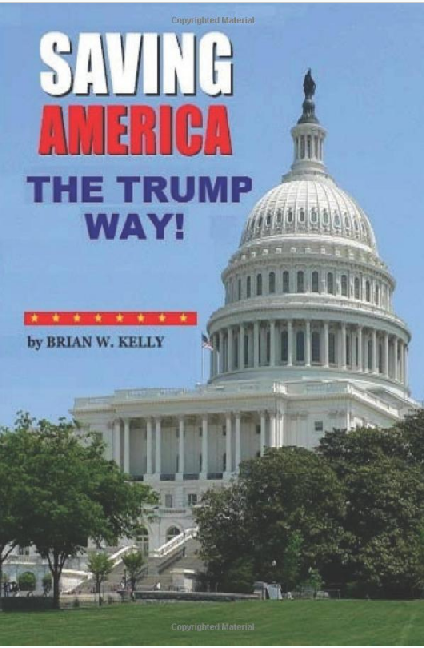 Your friends and family can read the updated book right on www.briankellyforcongress.com for free. Since the time he ran for Congress, Brian has written two more books on the subject. One is called the RRR Plan, a very comprehensive plan for reestablishing America as a business leader and Saving America, a detailed plan for saving America from financial ruination. These books are available in hard copy on the BookHawker site (www.bookhawkers.com). As noted, the revised text of Jobs! Jobs! Jobs! is also on this site packed in up-to-date essays. Each essay that is in the book is available on the right side of the home page under the Jobs! Jobs! Jobs! heading. Yes, it's free. No kidding. Even the book's Preface, a worthwhile read as an essay unto itself is on this site. The Preface is also included in the hard copy of this Brian Kelly for Congress book that you are now reading. It is where you should begin as it is another important essay on the Jobs! Jobs! Jobs! Landscape. If you would like to get the book in paper form, feel free to take the link to bookhawkers.com or www.trumpbookshop.com. Otherwise, it is on the web site for you to read and to enjoy. Thank you for choosing to visit the Brian Kelly for Congress web site. By reading the full content of Jobs! Jobs! Jobs! just like author Brian Kelly, you too will get an appreciation about jobs that you may never have had before. Kelly wants to create jobs in the US and in NEPA in particular and he outlines how it can be done when Congress finally wants it to be done. So far, it seems Congress is disinterested in anything that is good for America. They get their cues from President Obama. So far, as you well know, Congress has avoided its responsibility of helping Americans in need of jobs. For years, they have either taken no action or given more rights to foreigners and International Corporations. Instead of being a force to help the American people, Congress, especially this 114th Congress, now in session has chosen special interests over the needs of the American people. Along with Matt Cartwright from Northeastern PA and Barack Obama, they have permitted unbridled crony capitalism with huge corporate profits to the friends of Congress and cronies of the President. Meanwhile, the same corporations are shipping jobs overseas or bringing in foreign workers to replace Americans in their enterprises. This is not fair. That is why Brian Kelly is running for Congress -- to change the jobs scenario and many other scenarios that work against the people. Kelly thinks jobs are more important than special interests. Why not pick a person for Congress like you, who thinks like you do? Brian Kelly believes in the effort to restore reverence for God and respect for the unalienable rights to life and liberty in America. Should Government Be Left to the Politicians? Question: Who the heck do you think you are coming out of retirement, never having been in government or politics, and after challenging one of the longest serving representatives in NEPA, Paul Kanjorski, and losing in the 2010 primary to the incumbent, you now have the nerve to take on Matt Cartwright, one of Scranton's finest lawyers once from the firm of Munley, Munley & Cartwright? Shouldn't an opportunist like you just stay retired? Thank you for the question. I ask myself that all the time but not exactly as you have asked it. Why should I run for the US Congress as a write-in candidate? The short answer is that I care and I am deeply concerned that the current government is selling us all out for their own benefit. I am suspicious of anybody who is part of the current administration, Democrat or Republican! How's that for a start? Read more: Should Government Be Left to the Politicians?